Darlene Weaver, 93, of Peoria passed away at 7:30am on November 17, 2018 at Apostolic Nursing Home in Peoria. She will be remembered as “Aunt Darlene” to many nieces and nephews whose lives she impacted. Darlene was born on the family farm in Fisher, Illinois on February 15, 1925, to Avery and Lena Weaver. She was preceded in death by her siblings Florence Simonson, Opal Wilson, Glenn Weaver, Dorothy Birkey, Floyd Weaver and Robert Weaver. She is survived by numerous generations of nieces and nephews. Up to her final days, Darlene’s greatest joy was to have one of her little ones on her lap. Darlene’s family moved their belongings to Peoria County in the 1940’s in a pickup truck pulling a hay rack. She lived her remaining years here. For a number of years she, with her mother Lena had laying hens. They sold the production to a number of customers who became her friends. She is perhaps best known as the “Cookie Lady.” Many have claimed her sugar cookie recipe. 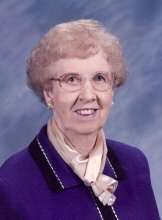 She was a longtime member of Grace Presbyterian Church. Her relationships with numerous friends from the church were very meaningful to her. During her time at Skyline, she was extremely blessed by and thankful for the visits from the pastoral staff. Darlene relied on her personal relationship with Jesus Christ throughout her life. Darlene’s life has been a miracle in many ways. She was born premature, weighing under 2.5 lbs. Her incubator in 1925 was a shoe box on an open oven door. Despite disabilities and physical setbacks Darlene managed to live a complete and independent life. Through many challenges Darlene was loved by and a blessing to many. The family of Darlene offer thanks to the staff at Skyline for the love and care she received during her lengthy stay and OSF Hospice for keeping her comfortable in her last days. A Memorial Service will be held in the chapel at Grace Presbyterian Church in Peoria on Wednesday November 21, 2018. Visitation will be from 10-11am and the service will begin at 11am. Burial to follow at Swan Lake Memorial Gardens. In lieu of flowers contributions can be sent to Apostolic Nursing Home 7023 NE Skyline Dr Peoria, IL 61614 or Youth For Christ 4100 N. Brandywine Dr, Peoria, IL 61614. "Email Address" would like to share the life celebration of Darlene Weaver. Click on the "link" to go to share a favorite memory or leave a condolence message for the family.